From small lodges nestled deep in the Patagonian wilderness, to mountainside spa hotels in Ushuaia, even here at the end of the world there's no shortage of places to lay your head. Our favourites are those that capitalise on their stunning location, through floor-to-ceiling windows, or included excursions. Ushuaia's accommodation is split into two categories. First, the hotels right in the hustle and bustle of town, close to the port and restaurants. These hotels are comfortable, central, and perfect if you're just looking for somewhere to come back to after a day exploring. If you're after the 'wow' factor, then it's the hotels out of town which have a bit more sparkle; they tend to have better views of the Beagle Channel, one even has a spa and infinity pool looking out from the mountains. Punta Arenas is the gateway to Torres del Paine, and also where you'll disembark from a cruise from Ushuaia. The options here are basic and comfortable, it's an easy-going town without a huge amount of luxury, but there's more than enough to provide a good night's sleep before stepping into the next part of your adventure. 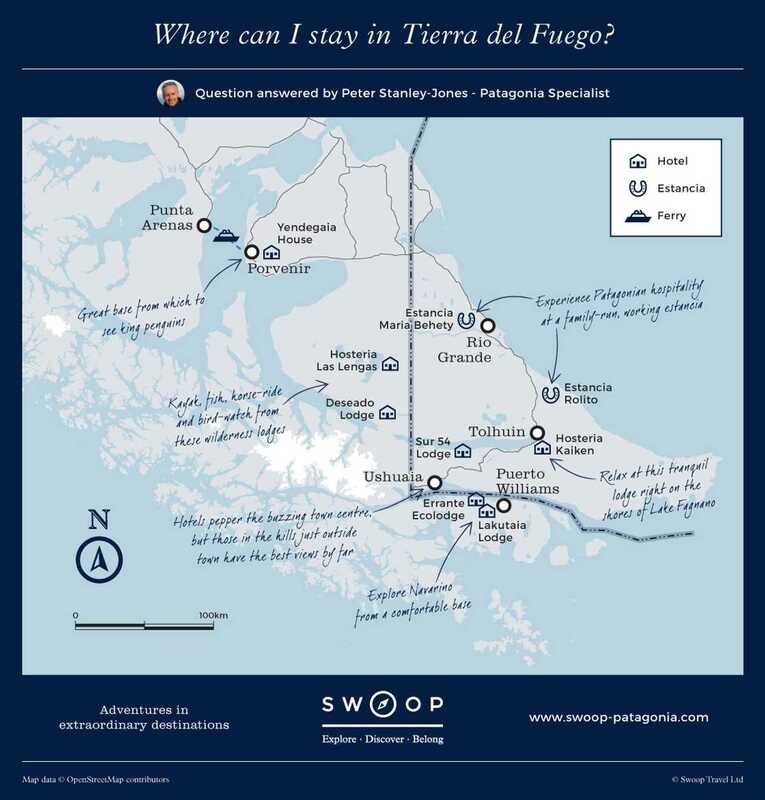 Where can I stay in Tierra del Fuego? The scenery is what you come to Tierra del Fuego for, so make sure you consider the views from your hotel window. Being able to see the boats arriving on the Beagle Channel, or the sun shining off the Magellan Straight, really makes you feel like you've arrived at the end of the world. As a base to explore Isla Navarino, Lakutaia Lodge is second to none. Their excursions include trekking to the island's best look-outs, bird watching, kayaking the Beagle Channel, a city tour of Puerto Williams and a visit to the fascinating ethno-botanical park. For those craving additional adventure, base yourself here before and after tackling the Dientes de Navarino trek, or book onto their Heli-fishing program to access hidden lakes and rivers around the island. The rugged landscape of Tierra del Fuego is speckled with wilderness lodges, where you can immerse yourself in Fuegian culture and explore the scenery right from your front door. Our favourites sit on the shores of secluded lakes, where you can kayak, trek bird-watch or fish with unobstructed views in every direction. Horse riding has been an integral part of the history here, and working estancias still exist where you can experience traditional Patagonian hospitality, and horse ride during the day. Adventure cruising is a great way to discover Patagonia’s rich wildlife and dramatic coastline, much of which is only accessible by sea. Sailing through channels and fjords you’ll hop into Zodiac boats to spot dolphins, whales, seals and seabirds, be dazzled by towering glaciers and in Tierra del Fuego you can even set foot on Cape Horn.